Want to take a daycation with the kids? Head over to Big Barn Farm for some farm time with the fam, as well as dogs, cows, chicken, ducks and sheep. Bring the whole family along with some sandwiches and lemonade and make it a fun picnic at the Big Barn Farm on Bannerghatta Road. Close to the National Park, the farm is green and serene owing to the proximity to official forest land. 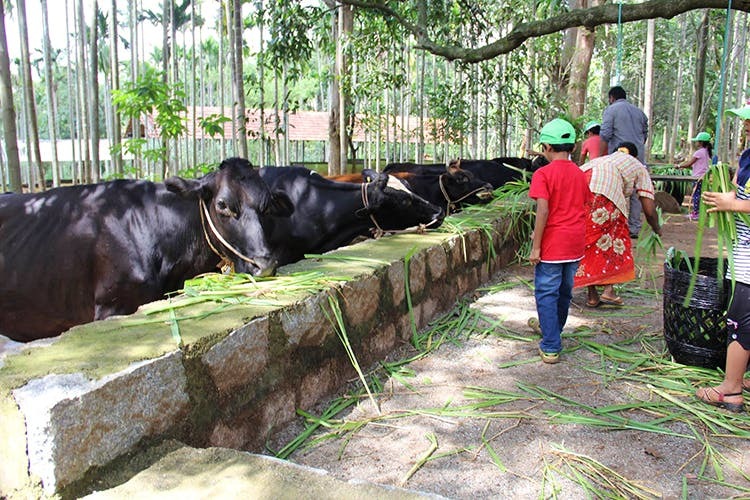 Aimed mainly at children, the working farm conducts a number of day camps and walking tours around the farm to help young’uns understand and connect with nature. A walk around the farm will see green pastures, small water bodies (and a waterfall! ), treehouses and rope bridges for monkeying around. The camps comprise of activities that provide a glimpse of farm operations like harvesting (or planting, depending on the season) animal care and, fulfilling the childhood fantasy of joy rides on a tractor (no judgement if you hop on we’re sure!). The experiences are customised to suit group size, time of day and amount of time spent. Since its a barn, expect animals like cows, chicken, goats, turkeys and all the other animals you can remember from the Old MacDonald rhyme. So activities may include egg collection, animal grooming, cow milking (it’s harder than it looks!) and feeding. Of course, if everyone is just excited to pet and cuddle their new friends, the animals are used to it and will happily take what they get! They do have an entry fee and an hourly charge, but it varies based on the package you choose and the number of people visiting. The maximum number of people the farm can accommodate per day (adults and children) is 80, and the minimum required for booking is 10 people. The numbers are important if you’d like to eat food (mainly lunch and snacks) prepared on the farm. If not, just pack your own and enjoy your day out! Since the experience is completely customisable call them a couple of days in advance to schedule visit with the number of children and adults as well as the expected time so they can plan the day best suited to your requirements.